A sea of white uniforms work in unison to †inspire and entertain while moving with the precision of a well-oiled machine. The group moves fluidly and cohesively throughout their routine, every step perfectly timed, all feet hitting the ground and lifting again at precisely the same moment. Looking across the formation reveals essentially no differences between the dozens of individuals on the field. Each is focused on one common goal -- putting on an impeccable exhibition of skill and determination for those gathered in the stands. At a quick glance from afar, the performers look as though they could be a marching band or some other group providing half-time entertainment at a sporting event. However, something sets this group apart. As one moves closer to the field, he or she will not notice looks of excitement beaming off the performers’ faces as each movement goes off without a hitch. Not one. This elite group goes about their business with a stone-faced seriousness that would make Buckingham Palace’s world-famous royal guards blush. At that moment, the U.S. Navy Ceremonial Guard, for many people the very face of the Navy, has reached the apex, the very peak of perfection. Trying to attain perfection, whether it is during an exhilarating fieldshow or during the most somber of funerals, is not easy. The process makes top-notch young Sailors deal with a constant routine of drilling, shining, buffing and grooming that, for most, is worse than anything faced in recruit training. The journey culminates with the one-time recruits becoming members of the guard and working routinely in funerals, drill performances and highly memorable ceremonies throughout the United States. For those Sailors, it all begins at the Ceremonial Guard headquarters in Washington, D.C., where trainees straight out of boot camp converge to prepare for a two-year stint as a guardsman. But, it’s hard to find even the tiniest shred of glory during the first several weeks trainees spend in our nation’s capital. Upon arrival, every new trainee immediately begins a six-week training cycle that molds the raw recruit into a basic guard member. During that time, their colleagues do not recognize the trainees as full guardsmen. In fact, trainees are not even allowed to speak to other guardsmen; that only comes after completing the training period. It doesn’t take long for a trainee to realize being stationed with the guard and being an actual guard member are two totally different things. The life of a trainee at headquarters can prove to be a tough experience, with a wide array of inspections proving to be a thorn in the side of a soon-to-be guardsman. The typical trainee, who is looking for a break after the inspection routine of boot camp, has uniform and personal appearance scrutinized at nearly every part of the day. The experience can be daunting to a new Sailor. “We have room inspections in the morning before breakfast, utility inspections after breakfast, locker inspections during the day, utility inspections in the afternoon and [we] can expect a surprise inspection at any other time,” said Airman Apprentice Bob Cronyn of the training platoon’s schedule. During the rigid examinations, inspectors regularly fail the trainees for neglecting to clip all strings out of the inside of their shirt pockets and failing to shine both sides of their brass belt buckles. The trainees also receive daily inspections on their haircuts, uniform press, white gloves and grommets, among other uniform elements. The highly-intense inspections are a necessary part of a guardsmans life, according to Konkol. Were talking about junior people who represent the entire Navy when they are out there, he said. When they are in the six-week training phase, we must teach them to be a sharp-looking, disciplined guardsman. A lot of what they do for inspections is an extension of us wanting to establish proper military bearing. On top of the discipline-instilling inspections, trainees must also learn the barracks. The routine affords most trainees only a couple hours of sleep a night. On top of the discipline-instilling inspections, trainees must also learn the skills of a true guard member during the training phase. To do this, the platoons squad leaders put the group through a rigorous series of drills with an emphasis on marching and rifle handling. The training sometimes continues throughout the day, with several water and meal breaks thrown in to keep the trainees refreshed. When faced with a daily pattern of work and inspections like that, the thought of quitting would cross many Sailors minds. For the actual trainees, keeping their thoughts trained on the end goal helps them stay focused. There are times when you wonder why you chose to come here, said Airman Nathan Nehls. But we know that the sense of pride we are going to have in front of so many Americans and our parents is too great to pass up. It keeps me going when I want to give up, but I can get close sometimes. The maddening routine is given an added twist by the training platoons squad leaders. Unlike boot camp, where recruit division commanders must be at least a second class petty officer, the guard uses a group of other guard members, typically E-3 and below, to train newcomers. Having seaman-on-seaman instruction is seen as one of the finest elements of the training cycle. Theres a good reason for it, said Seaman Jason Ramspott, one of four training platoon squad leaders. Were a bunch of guys who have played this game before. Weve been trainees, and weve been in the ceremonies. I think we are perfect to train these guys up. Who could do it better than people who have done it before? With that intent, the squad leaders become an integral part of the trainees lives. The two groups get used to seeing each other at all times of the day. The constant scrutiny helps to create a special love-hate sort of relationship between the two groups. Overall, we all get along, Simpson said. I mean, we have those days where we cant stand them and just wish they werent around, but we always appreciate them. Theyve done the things that we want to do, and they are concerned with how we are doing. They want us to succeed. Seaman Apprentice Emily Chvosta, another of the training platoons squad leaders, echoes that thought. Chvosta says the job makes her feel like more than just an instructor for the soon-to-be guardsmen. Were definitely mentors as well as platoon leaders, Chvosta said. We are all over these Sailors all day long for six weeks. We drill them, inspect them and are the first link in their chain-of-command. If they have an issue with something concerning training or even something personal, they can come to us and talk about it. We want to make sure they learn the ways of a guardsman, but we also want to see that they arent too overwhelmed with it all. If a trainee has an issue, theres plenty of time during the day for them to bring it up. The typical trainees day starts before 6 a.m., with morning room inspections. Then, following a day full of inspections and instruction, their day ends long after sunset with a flurry of ironing, shining and string clipping in their barracks. The routine affords most trainees only a couple hours of sleep a night. You definitely dont get much sleep; maybe an hour or two a night for awhile, said Airman Apprentice Andrew Bartlett, a new member of the guards firing party. Bartlett finished his training phase in early July. If you didnt get used to going without sleep in boot camp, youll have to learn early on here. Its a tough thing for some. Overall, its not exactly the type of life most recruits imagine when they are entering the final days of boot camp. It may even sound like something the Navy forces groups of new Sailors to do. Nothing could be further from the truth. While there are qualifications each potential guard member must meet, every person sent to ceremonial guard duty chooses the assignment during boot camp. In return for the assignment, most selectees voluntarily put off A school for the chance to go to Washington, D.C.
During their two years with the guard, Once the trainees complete the six-week period, the other, more-experienced members finally recognize them as full guardsmen. It is a moment the trainees look forward to. Those Sailors selecting A schools cannot advance past E-3. Despite that, the choice is an easy one for some. For me, it was a chance to do something that not many other people get to do, Ramspott said of his decision to join the Ceremonial Guard. Most of us end up getting guaranteed A schools after, but the main thing for me is to get the chance to represent the entire Navy everyday. Its a very big honor. Those without A schools are eligible to advance to petty officer third class in rates not requiring A schools. When they do join and become guardsmen, they get opportunities most other Sailors never receive. 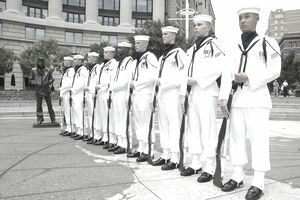 Many current guard members have been on hand for special ceremonies at the White House, at the Tomb of the Unknown Soldier, at ship commissionings and other events. Chvosta fondly remembers one such event. I realized the importance of what I do when I was there for the announcement of the name of CVN 77  USS George H.W. Bush. I was standing near [Bush] for the ceremony. I was a part of history in a way. Nothing tops that. In the little bit of free time they have, trainees are able to enjoy the comforts of their barracks rooms, which are comparable in quality to a hotel chain. Theyre nice rooms for sure, said SA Chesed Johnson. With some of the other fleet Sailors Ive talked to, I can see we have it pretty good. Theyre like a miniature two-bedroom apartment. They have to be better than most other barracks in the fleet. Once the trainees complete the six-week period, the other, more-experienced members finally recognize them as full guardsmen. It is a moment the trainees look forward to. Im not sure what its going to feel like, but I cant wait, Simpson said. I know we are all pretty much E-2s and E-3s, but having their respect means a lot to us. Its something we work for from the second we get here. After their six-week training period, the former trainees then join 1st Division in one of the firing party and casket bearer platoons, or 2nd Division in one of the drill team and colors platoons. Deciding who goes where in the command is a tough process, according to Konkol. We really look at three things when deciding that, he said. We always try to go with the desires of the individual, but we also want to take a look at the skills of the trainee. Sometimes a person will stand out in certain areas more than others. And there is always the manning issue. We have to do things that will keep us at the proper manning level in each platoon. And for former trainees, that point is when they first feel they have achieved a certain level of perfection. You feel invincible for a little while, Bartlett said of his first days as an official guard member. In a way, its one of the proudest moments of your life here. What Is The Brown Water Navy? What Are Appropriate Uniform Regulations for Navy Veterans?